A screen or projection surface is the usual target for a projector. Screens come in many sizes but normally come as a specific aspect ratio (width:height ratio), the most common being 16:9 (HD, UHD) or formerly 4:3 (SD). 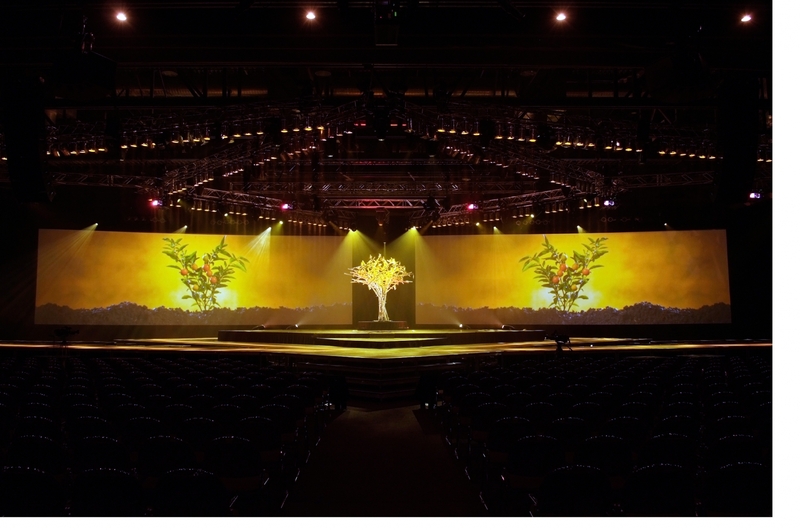 4Wall also carries a large and varied inventory of custom sized screens such as 45'x15' (3:1), 72'x12' (6:1), and even 80'x20' (4:1) which require multiple blended projectors. 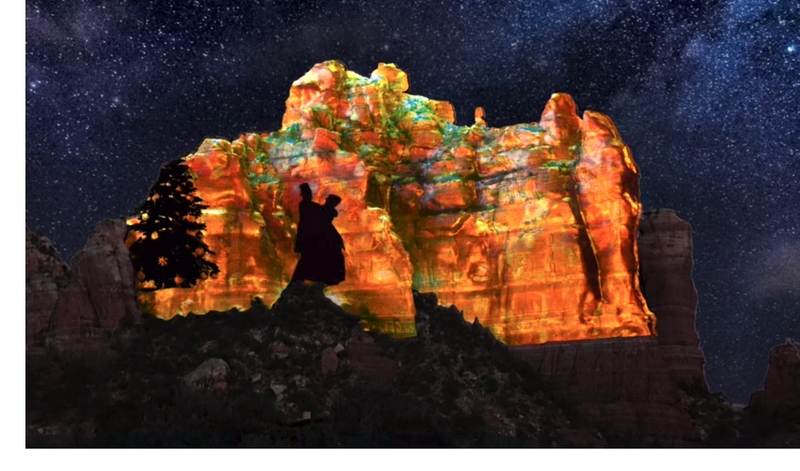 Other projection targets can include building walls, mountains, spherical domes, or three-dimensional objects with projection mapping. One important consideration when changing a specified screen's size - if you double the width dimension, it's now 4x the square footage and you must have 4x the projected light to maintain the same brightness level. Another way to think about this is that a 5K lumen projector on a 10ft wide screen has the same light per area as 20K lumens on a 20ft wide screen. As you can see, as the screen gets larger we will need a lot more power from our projector. A rear screen is a transmissive material that allows light through with some amount of diffusion or refraction. A front screen reflects light back to the audience. Some screens may be specified for both front and rear projection with one fabric; on these screens, the front projection performance is often lacking compared to a purpose-built front surface. Screen gain is given as a rating or factor comparing its light performance to a plain matte white surface. A gain above 1 will focus more light to the audience when viewed on-axis but may have other optical traits like hot spots with short lenses, or a small viewing cone (normally given as half-gain angle). A gain below 1 will have less light to the eye but may also reduce hot spots with short lenses and help projector blends look good from a wide viewing angle. A good rule of thumb for large rear projection blended screens is that you should not use lens throw ratio that is less than screen gain. Using a 0.67 lens on a 1.2 gain rear screen will show hot spots, and on a blended screen these hot spots will stand out. Contrast is simply the difference between the darkest (black) and the brightest (white) on the screen expressed in a ratio. In context or projection screens, higher ambient light reduces contrast by elevating the blacks. Poor contrast shows up as a washed out looking image. A gray colored screen may mute the total/max brightness but increase contrast (through reducing the impact of ambient light). In our screen inventory, we have a rear surface type referred to as RUW - Rear Ultra-Wide. These surfaces use a Da-Lite 0.65 gain "Ultra Wide" surface material, often built into a Draper StageScreen border. This material is excellent at reducing hot-spots when using short lensing and allows seamless screens up to 15.75ft in height. Our RUW screens are in high demand as they help create a seamless blended screen with high viewing angles. Combining this material with Draper's modular StageScreen system allows us to carry a large inventory of custom screen sizes at reasonable rental rates. 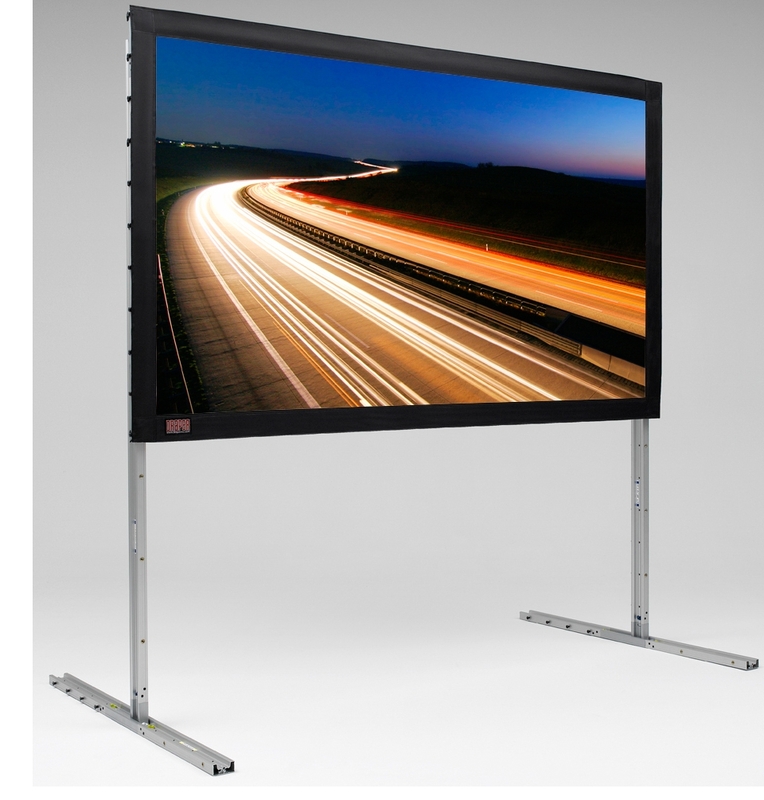 Draper's XT700V screen material offers similar performance (0.7 gain) in seamless screens less than 12' tall and may also have been referred to as "dual vision" or "dual view" with a 0.5 front projection gain. Da-lite (Fast Fold), Draper (Ultimate Folding Screen), and AV Stumpfl (Monoblox) each produce a frame system designed for setup speed and lightweight portability. These "collapsible" frames feature a folding design with few separate pieces making the screens fast and straightforward setup and break down. This type of screen is likely the most common found in use in rental & staging. Usually, these screens are sized 24ft wide and smaller and often are completed with legs and a dress or drape kit. 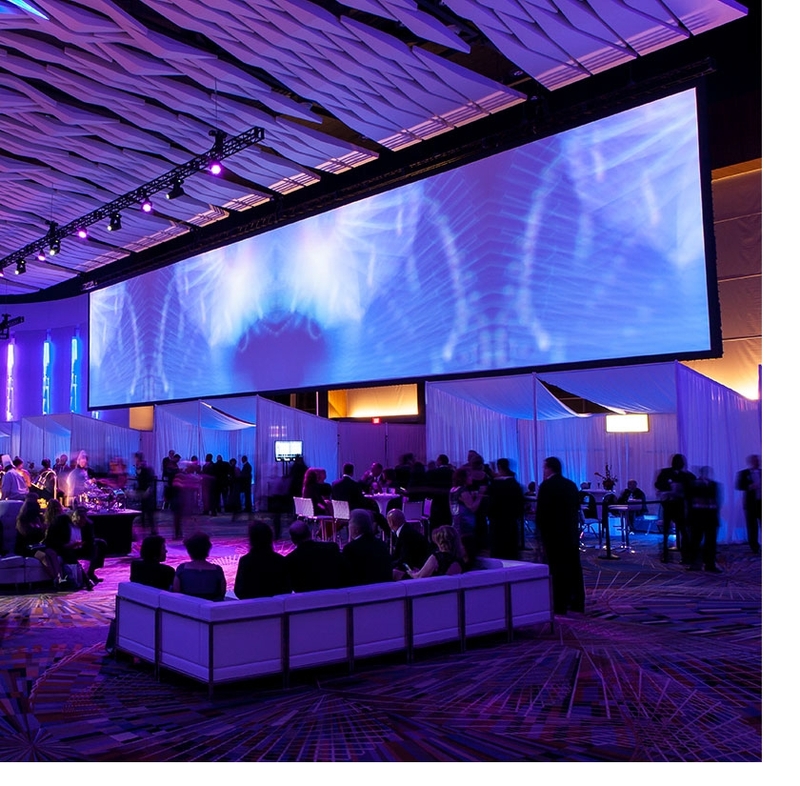 This large-format modular screen system is targeted at the rental & staging market. The primary construction is like a flat truss - an aluminum square tube with supporting cross members. The screen surface (or fabric) attaches with bungee loops, creating positive tension. Due to the modular nature of the frame, we can create any size out of existing parts and a frame failure does not remove a screen from use. 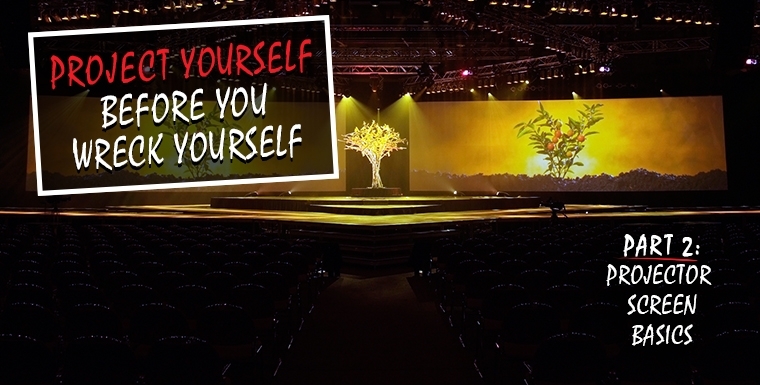 Common sizes are 16ft wide and larger and many wide-format sizes are available such as 30x10, 36x12, 50x15. Given a proper lead time, any size screen could be added to inventory at a reasonable rental rate. 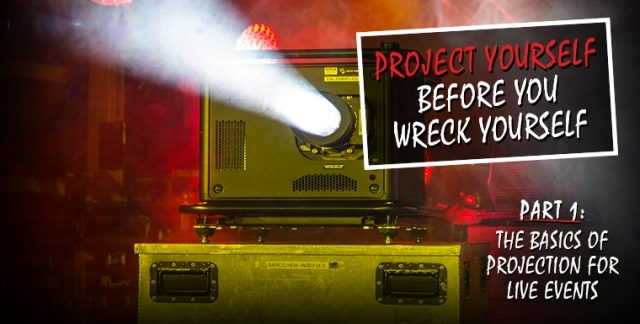 This medium-format screen system is targeted at the rental & staging market. The primary construction is an aluminum U-channel. The screen surface (or fabric) attaches with bungee loops, creating positive tension. We carry sizes in our inventory from 8ft wide to 14ft wide. Drape (or dress) kit and ground-support leg kits are commonly added. All FocalPoint and StageScreen frames are sent with assembly maps, and the parts are color coded for easy assembly. A frame map generator can be found on the Draper website. We may also provide frame maps that have been customized to improve stability, structure, and longevity of the product. Excellent screen - handcrafted. 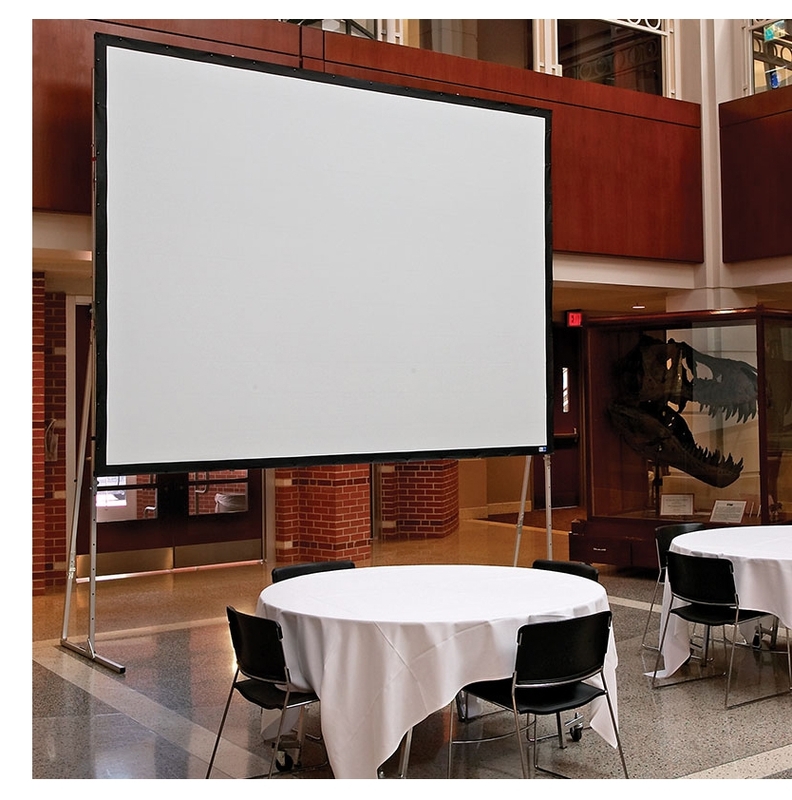 This projection screen is manufactured seamlessly in very large sizes with a lace and grommet border. The material is very particular and can only be rolled. 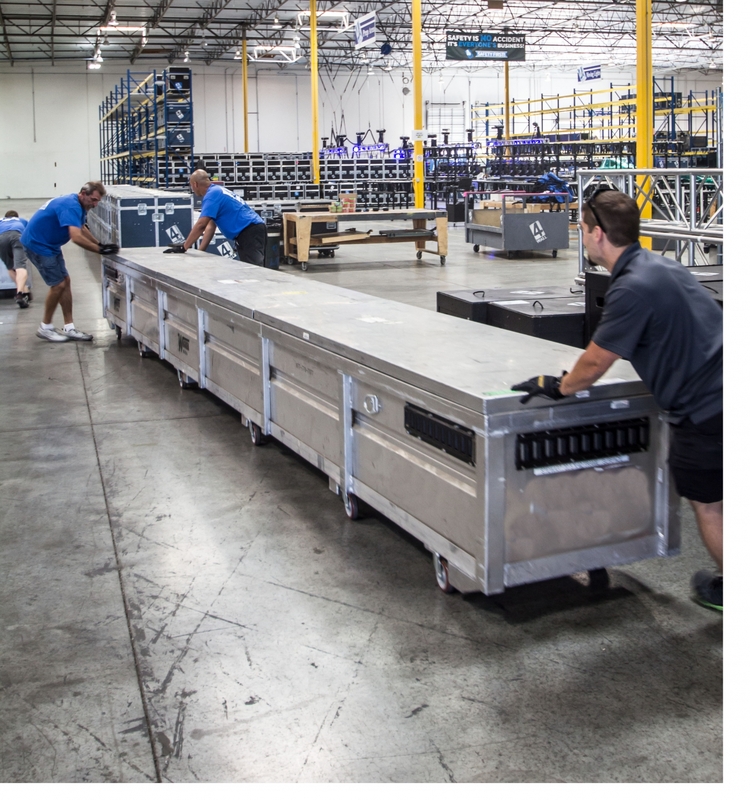 Because of the size and not being able to fold the screen, it can only be transported in a custom large rolling case which may exceed 20 feet long. To help prevent damage or tearing of these expensive screens, we must insist that a member of our team accompany them for setup/breakdown, or the client must have prior training and experience with the product. How Powerful of a Projector Do I Need? This is a common question. There is an ANSI/InfoComm 3M-2011 standard called PISCR (Projected Image System Contrast Ratio) that details various use cases. 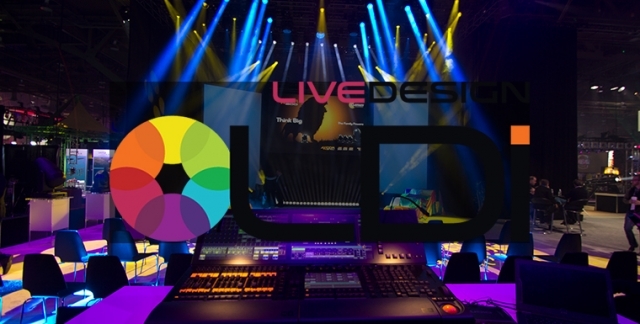 In short - for well saturated, good contrast projection with strong impact in live events you should aim for 50:1 contrast ratio (the "Analytical Decision Making" target). 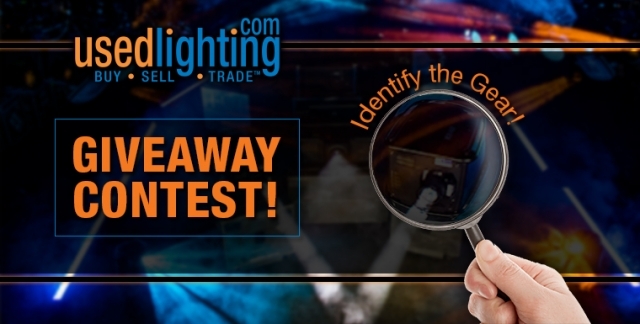 This means that projection brightness and screen technology are not the only pieces of this puzzle - you must know about your ambient light. Let's put it together in an example. We must decide between a 12k or 25k lumen 16:10 projector for an 11.25'x20' screen (1.0 gain). The 20' wide screen is 16:9, but our projectors are all 16:10. The projector will create a 20'x12.5' image, which is 250 ft². At this image size and full brightness, the 12k projector will have approximately 48-foot candles, and the 25k projector will have 100 foot candles on screen. If ambient light on the screen is below 1 foot candle (highly controlled room lighting, dark or dim audience) the 12k projector gives us a good result, a well-saturated image with good contrast. If stepping up to the 25k projector we will still need to control the ambient lighting on the screen to around ~2 foot candles for greatest impact, but we have double brightness versus ambient lighting; perhaps enough to light the room with house lights to take notes. Greg Parker is the Video Product Strategy Manager at 4Wall Entertainment. 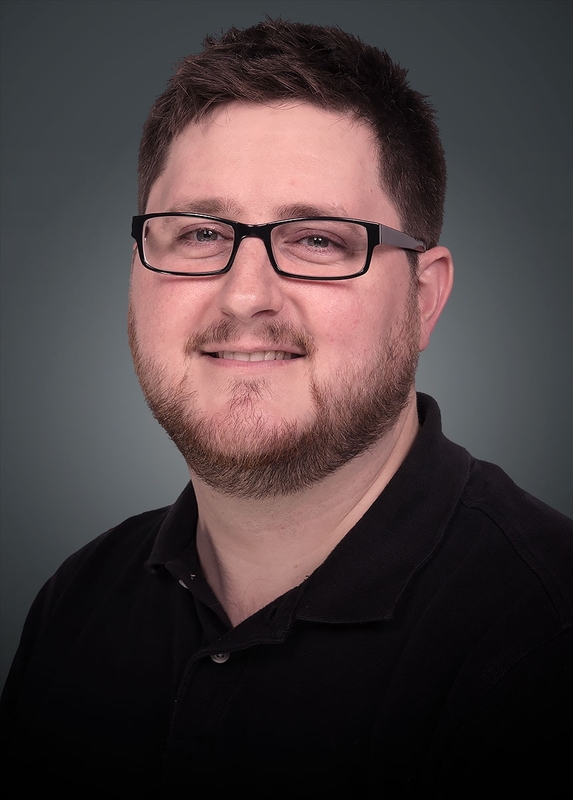 Greg joined 4Wall almost a year ago when 4Wall acquired video equipment provider Wagner Media, Inc. He is a manufacturer certified instructor for Barco Projection and Image Processing products.